lavera Mineral Quattro - Smoky Grey 01 contains 4 complementary shades of highly pigmented mineral eye shadow for intense & long lasting colour. This organic eye shadow is packed with natural ingredients and is particularly gentle on the sensitive eye area. Below are reviews of lavera Mineral Quattro - Smoky Grey 01 - 4 x 0.8g by bodykind customers. If you have tried this product we'd love to hear what you think so please leave a review. Great product I have the other colours as well. Good colours good for your skin and excellent brand. lavera Mineral Quattro - Smoky Grey 01 contains 4 complementary shades of highly pigmented mineral eye shadow for intense & long lasting colour. 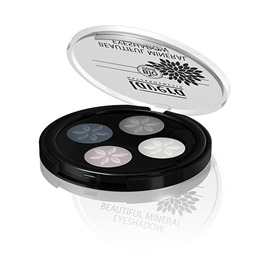 This organic eye shadow is particularly gentle on the sensitive eye area.